1. Greeting the day at Stingray World, Moorea. 2. Overwater bungalows at Sheraton Moorea Lagoon Resort & Spa. 3. Racoon butterfly-fishes on a Tahitian reef. 4. Gray reef sharks at Tiki Point. 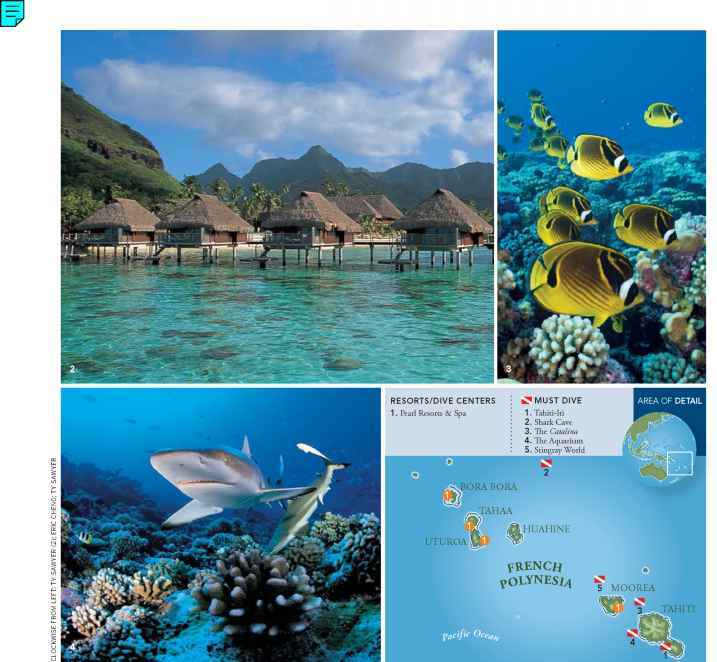 If you want drop-dead gorgeous topside scenery, exotic and wonderful people and the prospect of seeing sharks on practically every dive, then you probably can't do better than Tahiti. Black-tipped, gray and some impressively huge lemon sharks — all often approachable — make regular appearances on Tahitian dives. So do barracuda, humphead wrasse, sea turtles, surgeon fish, tuna and snappers. Reef residents often include some weighty moray eels. Occasional visitors include migrating humpback whales and — near some islands — manta rays. AVERAGE WATER TEMP: 82-84°F WHAT TO WEAR: A 3mm, or possibly just a skin in summer. AVERAGE VIZ: 130+ feet WHEN TO GO: Year-round, best diving April-November. 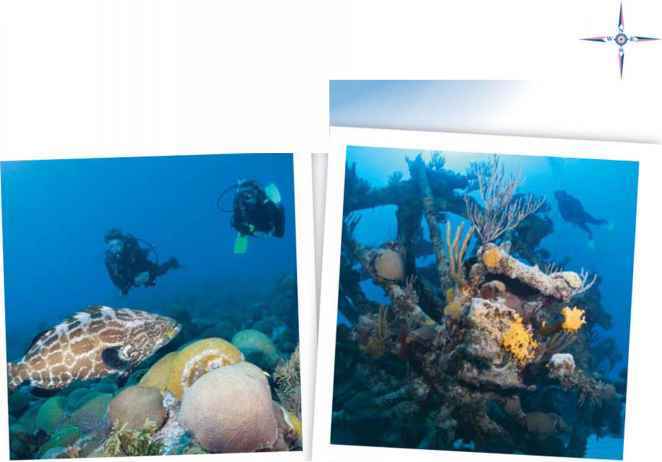 WHAT TO EXPECT: The full gamut; shore, wreck and live-aboard diving are all available. LANGUAGE: French, but most key resort and dive staff speak English. TAXES: Pre-included in the prices of goods and services, 50-150 XPF visitor tax on selected islands. ELECTRICITY: 220 V, but some newer hotels have 110. TIME ZONE: Same as Hawaii Standard Time (GMT -10), although Tahiti observes Daylight Saving Time, while Hawaii does not. of Moorea, Huahine, Raiatea, Taha'a, Bora Bora, Maupiti and Tupai, and the nearby Marquesas Islands and Tuamotu Atolls. These are the islands that entranced Captain Cook and convinced Paul Gauguin to leave his native France and live out the rest of his life here. Formed from ancient volcanoes and coral and viewed by many modern visitors as the last perfect places on earth, they are the islands that inspired James Michener's Tales of the South Pacific. With less than 1,360 square miles of landmass spread out over an ocean territory the size of Western Europe, Tahiti has plenty to entice undersea adventurers, including some dive sites that have yet to be explored. Wild, romantic, and utterly exotic, Tahiti is a temptress, and you'll find it easy to fall under her spell.